It’s that time of year again, where you seem to be constantly shopping and trying to figure out what special gift to get each person in your life. You’ve got a nice bottle opener for your wine-loving friend, and personalized coffee mug for your coffee loving friend, and a gift card for that friend who loves to shop. But what about that friend who loves their pets above all else? What can you get them? If your struggling to think of something, look no further! We’ve compiled a list of our favorite gift ideas for the proud pet parents in your life! Okay so whether you’ve got pets or not, you’ve probably tried to take a selfie with a dog before and it’s certainly not the easiest task of all time. This “dog selfie stick” is actually a piece that attaches to the top of your cell phone and has a tennis ball affixed to it, making sure that the dog’s attention will be on the ball but will look like it’s right on the camera! Perfect pet selfies every time! Get it now from Amazon! If your friend can’t seem to go longer than a couple hours without thinking, talking or worrying about their pet then a treat camera may be the perfect gift idea. Treat cameras can be loaded with your dog or cat’s favorite treats and dispensed at will via an app on your smartphone. You can see your pet in real time, and with some cameras, you can even speak to them. 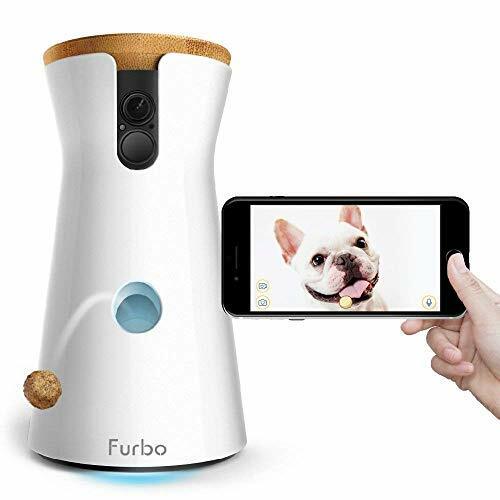 Our favorite treat camera is Furbo which can be purchased at Amazon. There are a lot of artists out there who offer pet portrait services, and it’s a gift your pet loving friend is sure to love and cherish forever. Find an adorable photo of their pet on their social media account and commission an artist who has an artistic approach you think they’ll love. This is a gift that will never go out of style. We have lots of t-shirts and sweatshirts with a variety of breeds. We also have merchandise for the pet lover in your life who likes wine and dogs or coffee and dogs as well as a variety of other sayings. Take a look at shop.yappylife.com. And no, we don’t mean putting a necklace on their dog or cat (although, that would be pretty cute). We found this adorable necklace and collar tag combo on Amazon for a super reasonable price, and we just know your pet obsessed friend is going to love it. So, what are you going to get your pet loving friend this holiday? Have some better ideas that we didn’t think of? Let us know in the comments!